Perhaps it’s time to acknowledge that this whole near-future and not-so-near-future experiment has been something of a misstep for Call of Duty. Last year’s Black Ops III was a decent enough shooter, reworking the existential angst of the Cold War for an era of AI soldiers and virtual battlefields. But it’s the exception, the lone slightly-brighter spot in an increasingly tedious trajectory arcing through Ghosts, Advanced Warfare, and now Infinite Warfare. We used to talk about “Call of Duty killers.” Little did we know Call of Duty would kill itself. It starts out well enough. Like many people, I actually watched Infinite Warfare’s E3 trailer with some amount of intrigue. “What is this game? It looks gorgeous,” I wondered, ships zipping around through the inky vacuum of space. And the campaign opens with some of that magic as your team plummets through Europa’s thin atmosphere to the icy surface. These moments are stunning—clear high points in the last few years of Call of Duty’s future-obsessed output. But a handful of brief highs and a heaping dose of spectacle do not make up for six hours of monotony, and after the successful intro Infinite Warfare struggles. You play as Commander-Who-Quickly-Becomes-Captain Nick Reyes, part of the United Nations Space Alliance (UNSA). They’re the good guys. The people you’re shooting this time are the Settlement Defense Front, or SDF, a group of rebels holed up on Mars. You know the SDF are the bad guys because...uh, well you don’t really know. I mean, their leader (a totally-squandered Kit Harington) speaks in dumb clichés like “We don’t fight, we attack,” and “Your cities will surrender, broken and weak. We will not fall.” Evil, sure. But you don’t really know why they’re evil, or like, what the hell they want. Except that they want to kill you. It’s not so much that Infinite Warfare is written any worse than its predecessors. No, the bigger issue is that Call of Duty now invents its enemies. It creates them from scratch, tries to ascribe motive to them, and fails. Ye Olde Call of Duty didn’t have this problem. It pulled from your preconceived notions, from stereotypes. You’re shooting Russians, because Red Scare. You’re shooting Islamic fundamentalists, because terrorism. You’re shooting Nazis, because they’re literally Nazis. It wasn’t a very sophisticated view of war or global politics, but clearly it resonated with players. Infinite Warfare aims for the same sort of no-compromises conflict. Nick Reyes and Co. are peacekeepers, bringing order to the solar system while spouting platitudes about freedom. It’s a G.I. Joe episode played out across millions of miles, complete with over-the-top moralizing. Worse is that the Call of Duty fundamentals of move-shoot-move-shoot-cover-shoot don’t hold up near as well as they did in 2007 when this whole thing really got moving. We’ve moved on. Whether it’s Battlefield 1’s brief get-to-the-good-part vignets, Doom’s kinetic rhythm, Titanfall 2’s fluid movement, or Shadow Warrior 2’s mayhem, 2016 has been a standout year for shooters. We've seen so many new ideas, so many ways to approach the well-trod trappings of the genre. Call of Duty, for all that it revolutionized the genre a decade ago, now feels frozen in time. It’s neither as tactical as it pretends to be nor as fast-paced as those who’ve now come after. It sits in an uncomfortable middle ground. Before we move on, the game also exhibits some technical woes: It takes forever to load into new levels, at least if you’re playing off a 7200 RPM hard drive like myself. This leads to some weird moments where the game’s clearly supposed to roll straight from a cutscene to the beginning of action, but instead you’re kicked to a black loading screen for a few seconds in between. The frame rate also takes a nosedive during chaotic sequences and ship battles. Call of Duty's familiar feel is doubly apparent in multiplayer. Infinite Warfare’s multiplayer offerings are just as loaded down as ever with weapons, attachments, streaks, et cetera. But it’s hard to recommend, especially coming in the wake of Titanfall 2. I don’t think Call of Duty’s ever gotten quite as comfortable with this wall-running, sliding, and double-jumping era as its estranged brother-from-another-publisher. Infinite Warfare’s arenas barely let you take advantage of your new mobility, with ever-present choke points and invisible walls interrupting the flow of maps and restricting players to a handful of options. 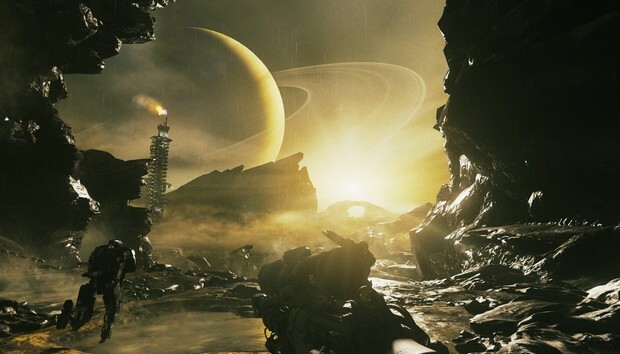 It’s a shame because Infinite Warfare’s arenas are a sight more impressive than Titanfall’s drab collection of same-y buildings and empty cities. Strip away the skyboxes and the fancy lighting though, strip the two down to just how they feel, and Infinite Warfare is the clear loser. Playing Titanfall and Infinite Warfare back to back the latter feels stiff, clumsy, and unresponsive by comparison. If for whatever reason you’re buying Infinite Warfare for the multiplayer, it’s also worth mentioning that the game hasn’t exactly had a rousing start on the PC. That’s not too surprising—many were dead set against this game from the start, and Call of Duty’s been a console-first property for years. But when your game is struggling to maintain the same number of concurrent players as last year’s game, a year later, well, the outlook isn’t too great. Finding multiplayer matches has been pretty slow, especially once you stray from the Team Deathmatch wheelhouse to more niche modes, and the population is pitiful compared to even years-old games like Left 4 Dead 2 and Payday 2, let alone thriving communities like Rainbow Six: Siege. The people who buy Call of Duty solely to play through the Zombies mode are the smart ones because every year it’s the most consistently solid part of an increasingly lackluster package. As I said before, it’s been one crazy year for shooters. Call of Duty: Infinite Warfare doesn’t stack up, be it the campaign or (worse) the multiplayer. Boring on the one hand, bad on the other, with Zombies and a handful of spectacular moments not enough to save this year’s outing. The further the series pushes into the future, the seemingly worse it all gets.